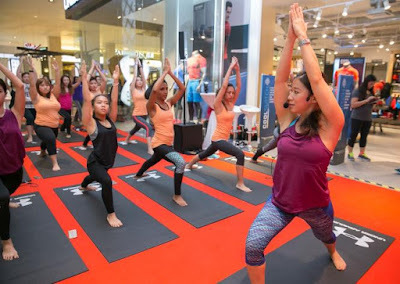 In conjunction with International Women’s Day, Under Armour in collaboration with Biotherm Malaysia has successfully organised an event aimed at encouraging healthy living among the community and to educate the public on the importance of overall wellness. The event was held at the Under Armour brand house in Pavilion Shopping Centre. 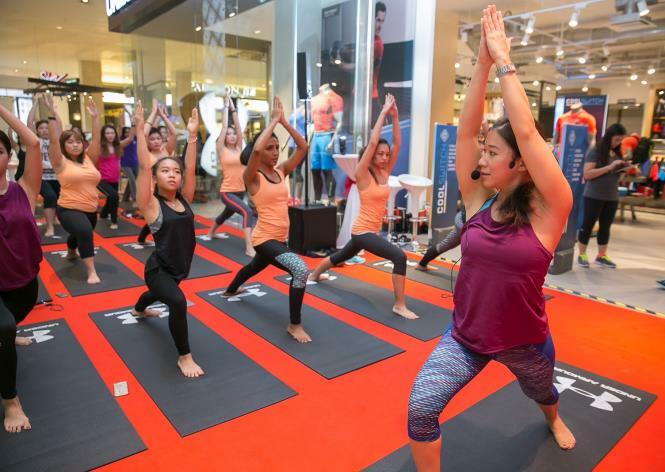 Registered participants were given the opportunity to practice yoga with Under Armour’s Brand Influencer, Robyn Lau and Brand Athlete, Atilia Haron. They were also treated to a special Facial Yoga session conducted by Michelle Tay, Biotherm Malaysia’s Education Manager, specially curated to help participants achieve the post workout glow. Robyn Lau, Under Armour’s Brand Influencer guiding the ladies into their yoga poses. 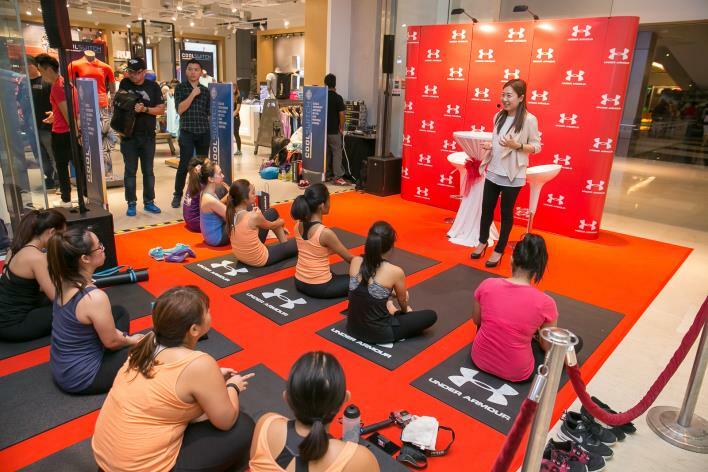 Atilia Haron, Under Armour’s Brand Athlete intensified the second yoga session by getting the ladies into splits. “Today’s event is all about celebrating women and their achievement worldwide. In the words of famous Russian novelist Ayn Rand, "The question isn't who's going to let me; it's who's going to stop me." Under Armour clearly acknowledges all the efforts women have done to inspire those around them and we want to encourage everyone to promote healthy living amongst yourself and those in your community.” said Lynn D Ong, Assistant Marketing Manager of UA Sports Malaysia Sdn. Bhd. “Biotherm new rebranding journey endorses the #LIVEMORE attitude to promote a fitter and healthier living. With this attitude, we encourage consumers to lead a ‘more fit’, ‘more health’, ‘more beauty’ lifestyle and together with the life power of water from Biotherm, we can achieve a healthier, natural beauty.” said Guendeline Phoon, Senior PR & Digital Executive of Biotherm Malaysia. Michelle Tay, Biotherm Malaysia’s Education Manager, educating the ladies to achieve their post workout glow. Also present at the event was Debbie Goh, Malaysia’s film and TV actress, and Deborah Henry, Co-Founder of the Fugee School, a non-profit charity organisation that provides basic education to refugee children. Deborah shared her experiences with the participants, detailing how she got involved in teaching refugee children. Deborah Henry, former beauty queen and Co-Founder of the Fugee School sharing her experience in teaching refugee children. Debbie Goh, Malaysia’s film and TV actress inspiring the ladies on her fitness journey. “What we are doing is providing these children with the right academic, creative, and life skills to enable them to have a brighter future. Everyone has a right to education and a healthy life, and Under Armour has graciously contributed a number of yoga mats for our students. Thanks to their contribution, we believe that this will definitely make our students happy as they are able to cultivate a new hobby that is beneficial for their well-being.” said Deborah Henry. “Life hurls us challenges every day. Sometimes, you just feel like throwing in the towel. That’s why it’s important to always see the bigger picture and realise the core reasons and motivations behind what we do. Always stay strong and true to yourself, and think to yourself, I will.” advised Debbie when asked about what her inspiring message to young women would be. The ladies coming together after their yoga session for a group shot. As part of the ongoing promotions for the day, participants were all given a 20% discount on all storewide purchases of Under Armour items, and were also treated to a complimentary skin analysis by Biotherm Malaysia. 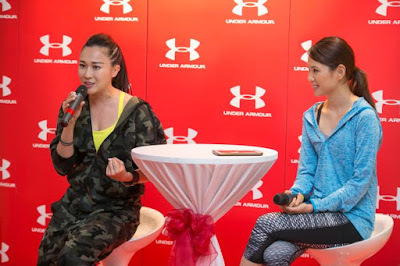 Additionally, from 9th–13th March 2016, Under Armour and Biotherm Malaysia had a series of promotions. Customers who spent RM350 and above in any Under Armour brand house were eligible to receive a free Biotherm sample pack. Moreover, for those who purchase any Biotherm products, they were able to enjoy a 20% discount when they purchased two items and above in all Under Armour brand houses when they show a proof of purchase.